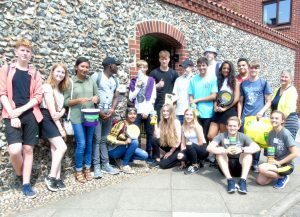 St Martins recently benefited from the enthusiasm and energy offered by several groups of teenagers taking part in National Citizen Service (NCS) in Norwich. NCS is a government initiative open to all 16 and 17 year olds in England and is a chance for them to take part in social action projects and build skills for work and life. The young people worked together in teams to deal with a local issue that they are passionate about. 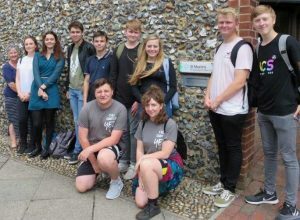 We felt fortunate that the NCS students in Norwich felt strongly about homelessness and were keen to use their time and resources to make a difference to vulnerable people in their community. This eagerness – coupled with our ability to accommodate the needs of their project – meant that our clients benefited from the scheme. The students thought of innovative ways that they could help homeless people – and they ran their ideas by us before they put their plans into action. The groups asked if they could volunteer in our hostels and care homes but we are unable to accept volunteers under the age of 18. Unfazed but this, they asked for a list of items that would be useful at our hostel – such as basic cooking equipment, kitchen utensils and toiletries. One of the groups wanted to donate books for our clients to read and they considerately chose the titles. Another group packed bags for shoppers at a local supermarket and collected an astonishing total of £1,533.45 over two days – a testament to their hard work, public generosity and a response to seeing young people taking action in their community. We delivered our ‘Reality Check’ presentation to the NCS students and received positive feedback from the young people and the NCS organisers. During the presentation, St Martins clients spoke about their experiences of substance abuse and the impact it has had on their lives. The presentation is hard-hitting, honest and shows the very real and devastating consequences of drug and alcohol addiction. Our hope is that the young people taking part continue to pursue a social conscience and generous attitude into their adult lives. These are the next generation of supporters of St Martins!